This review is contributed by James Tan. 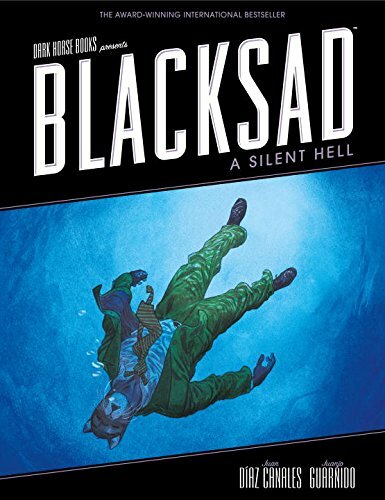 Blacksad: A Silent Hell is another volume in the comic series of John Blacksad, the private detective. The book, translated from French, is published by Dark Horse for the English audience. If you like anthropomorphic characters, you will love John Blacksad - a feline cat - as he investigates various thrillers filled with suspense. The first comic album Somewhere Within the Shadows involves the murder of a famous actress whom he had a relationship with. Arctic Nation on the other hand leads Blacksad into the world of inter-racial violence and racial segregation. The stories are set in America in the 1950s and lovingly created in a film noir style, with its fluid draughtsmanship and masterfully painted watercolours. The stories are written by Spanish authors Juan Díaz Canales (writer) and Juanjo Guarnido (artist). Guarnido’s art is really fantastic and creates a realistic world where animals are more humans. In The silent hell, the artist brings the reader to New Orleans with its jazz and voodoo magic. Blacksad is investigating a missing musician and gets more than he bargains for. The pacing of the story is wonderful, and Guarnido’s drawings of various animals that depict the personalities and roles in the story are interesting. There is a hippopotamus as the rival detective and the missing Jazz musician is a dog with a drug addiction. This album has the additional bonus of two short stories and what I like best is the "making of" section, where Guarnido generously shares his technique and thoughts in creating the lush watercolour backgrounds and how he tackles the various problems in creating different watercolour scenes and characters. If you like this book, you will find the other comic in the series worth a read, especially the compiled 3 stories in one, published by Dark Horse too. It’s one of the best books of 2014, by Amazon Editors Favourite books of the year.